I am a fixer by nature. I’ve heard it said many times that is true of men. We tell them our problems, just hoping they will listen, and all they can hear is us asking them to fix it all somehow. I’m about as girly as I can get, but I’m just like that. I hear the ones I love talking and all I can do is brainstorm ways to make it all better. I’m too quick to offer solutions, to share similar experiences, to suggest ways to repair what is broken, and to point where I think things went wrong. But lately? Not so much. Y’all, there are some things that look like they are just too dang big to fix, too broken to ever put back together. Bloody messes abound. All the words fall short. Experiences I have known cannot compare and it would be insulting to even hint that they could. I am seeing brokenness I have never known, hearts so wounded for so long that I really can’t blame them for trying to hold all those pieces together with all the mess they’re trying to cram in the cracks. I don’t have a single stone to throw or word to say. Well, yes. Yes, I do. I have just the thing. Just the One. The truth is, sadly, much of what I learned in a clean, padded pew for years on end really hasn’t prepared me so well to wade through this weary world. All in the world I do have to give is what I learned in the fire, when life burned me so bad my smile would melt right off for all the congregation to see, when it was impossible to tie my broken life up in a pretty bow that folks could smile at, when I found my stubborn self on my face before God because I couldn’t have stood on my own if I had tried. And as much as the world may not want to hear it, even as we are drowning and dying and despairing alone, that hope has only one name: Jesus. He alone can heal. He alone can bind up the brokenhearted, bring the adulterer home, heal the dying, restore the broken, protect the orphan, build the family, clothe the naked, comfort the widow, erase the cancer, rewrite the story, rebuild from the ashes… He alone. He can AND He will. In our pursuit of happiness, of bright, white lives with cleanly cropped corners and filtered faces, we have put on a front and pushed our only hope so far back I fear we’ve lost sight of Him. 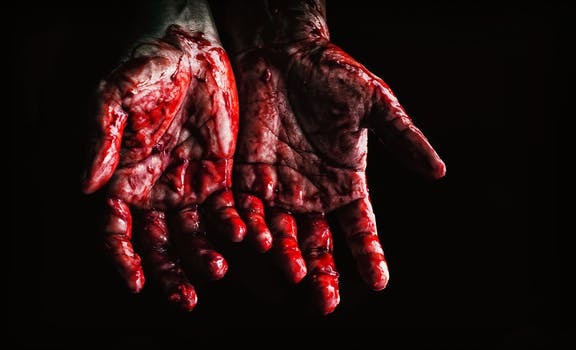 In our attempt to make ourselves clean, we’ve failed to remember we really do want to covered by the blood. As surely as the blood on the doorposts in Egypt saved the firstborn sons, when we put on Christ, death will pass right over us. The enemy comes to steal, kill, and destroy - that is true. He wants nothing more than to destroy our marriages, our children, our homes, our very lives. He is deceptive, cunning, and sly.The world we live in has bought his lies hook, line, and sinker. Believers are made to sound like fools if they acknowledge where this brokenness has come from, but friends, do not be deceived. We are not without hope. Our greatest assailants are bound when Christ is our protector. Our Father's promises are true. He will make all things right and all things new and if things are still broken, we can believe He is not through. His promises are true. We have a Father who loves us with such a fierce, faithful love that He not only promises to fix what is broken, once and for all, but to make something new from those pieces, something so grand we could have never made it on our own. Moreover, He promises to use those very things to bless and heal others when they’re broken and longing for healing one day, too. He works all things together for the good of those who love Him and He’s better gift giver than any parent can claim to be. Nobody loves like He loves you and me. So, as I sit here watching so many things unfold that I know I cannot fix, I'll not be so quick to offer solutions, to share similar experiences, to suggest ways to repair what is broken, to point out what I believe is wrong. Instead, I'll remember how it felt to be broken, how all the words in the world fell short, and I'll use my ordinary empty hands to hold tightly to what is mine to hold, to love with all that I am, and to lift all the rest to the Lord. My job is to love. His is to heal. God says we will be known by our love, so let us love - not fix - well. May our lives point the broken to the only One who can truly heal any of it: Jesus. Christ alone. He's the only one big enough for the job anyway. He’s worthy and He’s true and He’s going to take real good care of you.